Halifax Sunday League leaders Hollins Holme suffered only their second defeat since promotion to the top flight this season when beaten 2-0 at home by Bowling Green on Sunday. Boss Joel Booth said his mis-firing strikers had blown six or seven good chances with James Chadwick, George Bamford and Jamie Gwilliam unable to find the net. However, the strike force wasn’t totally to blame. Green had taken the lead with a free header after 10 minutes and then cashed in on a goalkeeping error from Chris Garbutt to double their lead before the break. Ryan Brook, a former Hollins player, was a rock in the Green defence and broke up numerous Hollins attacks. Booth said Andrew Butterworth had been similarly solid in the home defence but last year’s Division One champions needed to be more clinical in the top flight. “Last season we could afford a couple of misses and still score six or seven but you can’t do that in the Premier,” he said. Lee Mount moved to within two points of the leaders courtesy of a 6-2 win at Feathers while Halifax Hammers went above Elland Sports in mid-table after beating their rivals by the odd goal in 17! Old Pond pulled clear of the bottom two with a 3-1 success away to Oddfellows, whose quest for a first league win of the season goes on. Bradshaw produced the eye-catching result in Division One, ending Ryburn United’s 100 per cent start to the season with a convincing 6-2 success. Martin and Chris Woodhouse set the example with their workrate up front and the rest of an improving Bradshaw line-up followed suit. Chris bagged four goals while Martin was unable to match the level of his general play when in front of goal. Bradshaw were 2-0 up at half time with shellshocked Ryburn struggling to get into the game. The home side added another two goals to virtually sew up the contest before the visitors were able to make a mark. Ricky Beaumont, who came on for the injured Jamie Moorhouse, scored one goal for Bradshaw and made another with James Dodd the other successful Bradshaw marksman. United’s loss was good news for Mount Tabor, who stretched into a four-point lead at the top with a 2-0 win over Triangle at Savile Park. Jacob Wood hit the bar for Tabor in the first half but the visitors still led 1-0 at the break thanks to Daniel Willars’ corner kick which should have swung away from the goal but instead went straight in. The Triangle ‘keeper kept his side in the game with some good saves but Mount Tabor player-manager Andy Parker doubled his side’s lead with a fine goal midway through the second period. The centre half intercepted a pass on half-way, surged past three opponents and his shot beat the Triangle custodian, who got a hand to the ball but could not keep it out of the net. James Thorpe was solid at the back for the winners while recent signing Connor Ryan also showed up well. Royd Club dropped two points away to lowly Rastrick BC in Division One but it could have been worse as they finished with nine men. Ben Fairburn and Gavin Higgins both got their marching orders. After a goalless first half at Carr Green, Rastrick scored first but Royd Club equalised when down to 10 men through James Redmond. Rastrick had the lion’s share of the possession after the second dismissal but their visitors battled hard to hold on for a 1-1 draw. Brown Cow maintained their lead at the top of Division Two with a 4-3 success at Halifax Rangers, but they were pushed all the way by their hosts. Peter Bowe’s home side felt they deserved a point, fighting back well after trailing 3-0. Scott Carney broke clear to open the scoring after 15 minutes and he was the difference between the sides in the first half, cutting inside twice to move Cow further ahead. Rangers were buoyed by Shaun Kellett’s close range effort just before the break after stand-in keeper Luke Robinson had only parried Matt Smith’s header. Two minutes into the second half Grant Metcalfe reduced the arrears further, placing the ball wide of the keeper from a tight angle. Rangers then had the best of the chances but Brown Cow restored their two-goal advantage when Kyle Tyers arrived unmarked to head home a free-kick. Rangers weren’t finished. 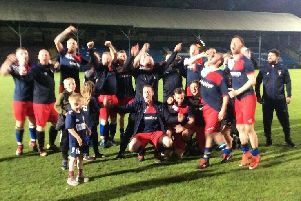 When Smith was felled in the box, Metcalfe converted the penalty and the home side dominated the closing stages, despite losing skipper Bruce Forsyth to a red card. Rangers missed several clear-cut chances. The chief culprit was Marty Bishop, who hit the bar for the second time in the game, put the ball wide with the goal gaping and in the last minute blazed over from five yards out. Weavers were 4-2 winners against an Ovenden Phoenix side who belied their bottom of the table status with some attractive play at times. Trav Allinson fired just wide for Phoenix in bright sunshine before Weavers attacked and Gav Martin forced the first of several smart saves from Nathan Hunter. Allinson curled a free kick over the wall but also just over the bar and Weavers took the lead when Jamie Casey turned the ball home. Ovenden went on the attack and from an Adam Rayner cross Cam Bowman had time to control and arrow a shot into the bottom corner for the equaliser. Within two minutes of the start of the second half Ashley Smethurst had beaten his man and fired a curling shot into the top corner for 3-1. Phoenix kept at it and Adam Rayner went on a great run, beating two players before hitting the post. Weavers forced three corners and from the last of them James Dixon fired through a crowded penalty area. However, Joshua Brown had the last word for Ovenden. Halifax Hammers Reserves and Beehive and Cross Keys both maintained their promotion challenge.